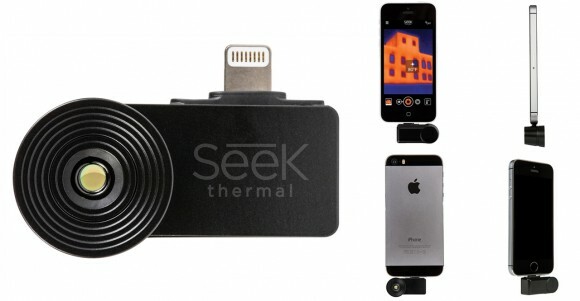 The Seek thermal camera accessory for Apple iOS devices is now available for sale with a price of $199 USD as up until recently only the Android-based version of the device was up for sale. The Seek thermal Camera for iOS is designed and optimized to be used with an iPhone 5, 5c or 5S as well as iPhone 6 and 6 Plus or iPod Touch 5th Generation, but the device will also work with iPad Mini (all versions), iPad Air and iPad 4th Generation. Since the iOS version of the Seek thermal imaging camera is using the newer Lightning interface for connecting to the smartphone or tablet it will not be compatible with devices such as iPhone 4S or older as well as iPad and iPod touch models that use the old larger Apple connector. Also, apart from a compatible Apple iOS device with a Lightning interface you would also need to have it running iOS 7 or newer version of the operating system in order for it to work. The specifications of the iOS version of the accessory are the same as the ones for the already available for a while Android version of the device, the price is also the same, so it is up to you to get the right model based on your smartphone type. 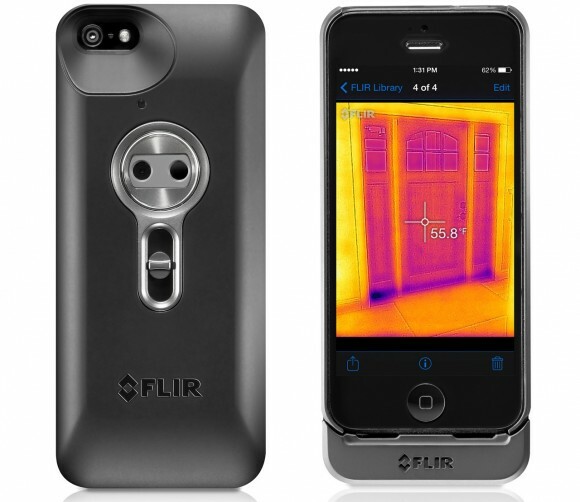 The important thing is that the iOS version is now also available, but unfortunately just like with the Android version you can currently order and have the Seek thermal imager from the official website only to United States and Canada, no other countries are currently present in the shipping to list. Hopefully we are soon going to see the Seek Thermal camera accessory also available worldwide as the price for the device along with the very good specifications that it has, at least on paper, make it really an affordable and interesting solution for a lot of users around the world. The Mu Optics Thermal Imager was a project for an affordable thermal camera with the resolution and software capabilities to make it useful to normal people is the form of a smartphone accessory. The project was launched and successfully funded at the end of March 2013, however the development was just recently cancelled by the people behind the project. 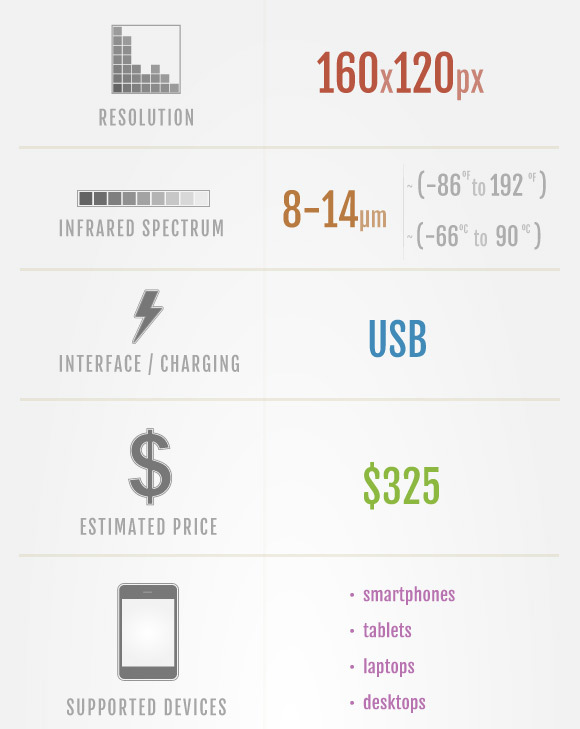 Back when the project was announced the specs of the device looked pretty nice for an affordable thermal imaging accessory for smartphones or tablets as in 2013 the market was not attacked by many similar devices like it is now. 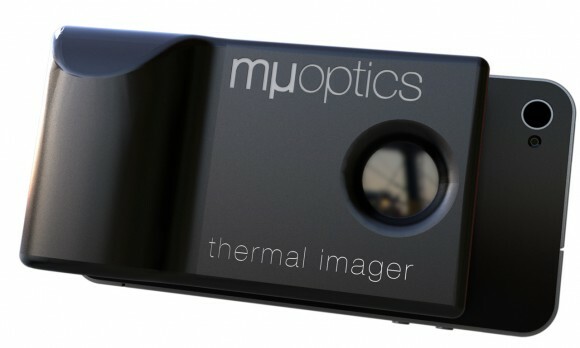 The Mu Optics thermal camera accessory was supposed to come with a 160×120 pixels thermal imaging sensor, be able to detect temperatures in the range of -66 to 90 degrees Celsius, supporting Android and iOS mobile devices and come with a price tag of $325 USD. Last year these specs looked really good, but now there are already a few products available on the market with similar specifications or even better and with similar price or lower. The cancellation of the project was announced citing precisely the competition that is already available on the market, though we would’ve still liked to the the Mu Optics thermal camera available. Even if it was only available to backers of the crowdfunding campaign that the project had last year and it got funded by almost 2000 people with many more showing interest in the product after that. Anyway, it was a bit of disappointment to see the project getting cancelled as it was apparently already close to the final product being ready for production. Do note that the official website of Mu Optics does not have a mention about the project getting cancelled, the information was published on their IndieGoGo project campaign website only!